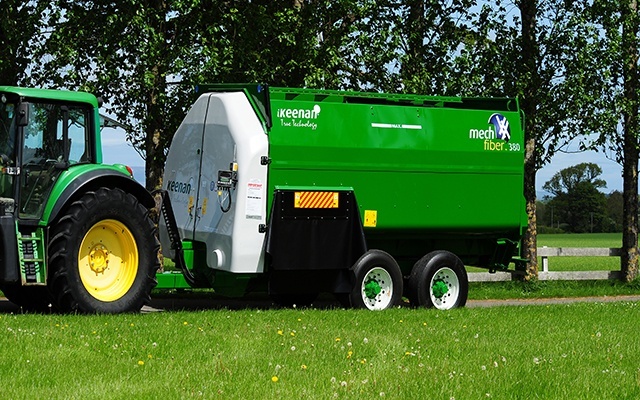 Keenan is Ireland-based global manufacturer of farming solutions such as feed mixers and wagons. Alltech has agreed to acquire Keenan, a leading farming solutions company in Ireland. Keenan, now part of the Alltech family of companies, is the 14th acquisition for Alltech globally since 2011. "Between Alltech's primacy in science and Keenan's manufacturing strength and technological know-how, we have a winning combination for delivering greater farm efficiency and profitability direct to our farming customers," Dr. Pearse Lyons, founder and president of Alltech, said. Alltech and Keenan have identified possible growth opportunities together, which may include nutritional technologies and feeding programs focused on feed efficiency and herd health as well as advanced ration formulation. The Keenan farm mixer wagon, also known as a "green machine," has earned a reputation for its reliability and service. Keenan mixer wagons, together with InTouch technology are designed to deliver the optimal on farm feed mix consistently. Alltech confirmed its acquisition of Keenan April 22. "This is an exciting time for Keenan to join us here at Alltech," Alltech chief executive officer Alric Blake said. "Alltech is looking for avenues to better deliver the Alltech brand to farmers and provide nutritional solutions to those who directly benefit from their use, whether in animal or crop production. Science and technology are at the forefront of everything we do. This new journey with Keenan further strengthens our ability to deliver on-farm nutrition solutions." Keenan will continue to be headquartered in Borris, Co. Carlow, Ireland. Together, Alltech and Keenan employ nearly 300 people in Ireland and close to 5,000 globally. The Keenan farm mixer wagon, also known as a "green machine," has earned a reputation for its reliability and service. Keenan mixer wagons, along with InTouch technology, are designed to deliver an optimal on-farm feed mix consistently.